Lock in a great price for Iliovasilema Hotel & Suites – rated 9.1 by recent guests! Beautiful views and outdoor areas. Staff was very friendly. Wonderful view, clean, spacious and beautiful rooms. Nice staff. I loved everything about this hotel and even the staff was so extremely helpful. even though I was there for one night they were willing to assist in the remainder of my stay on the island of santorini in anyway. This place is amazing! I had expected to be buried in the crush if small houses in the town but we were on the edge of the caldera with the most incredible views. The staff could not have been more helpful and the room was very romantic but with up to the minute shower and bathroom. Very comfortable too. The staff is amazing!! Will go out of their way to help and accommodate and even offer a few surprises! 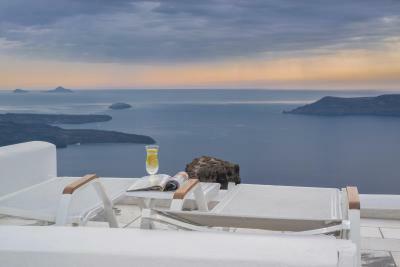 Great view and amazing sunset view ... nice for couples and honeymoon. 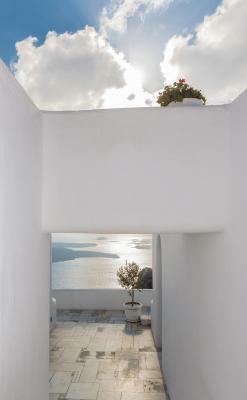 The Location in Imerovigli is outstanding and the view of the Caldera was stunning. Breakfast variety is excellent and the food is good in general. GREAT VIEW OF THE ROOM AND WE ENJOYED IT VERY MUCH! 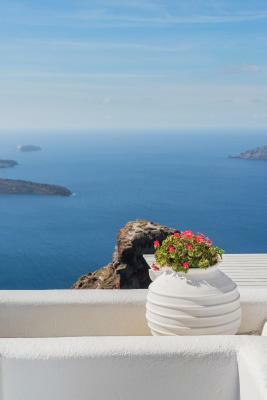 The view is the best of any place i’ve Stayed on Santorini over the last 40 years, the panoramic view was superlative. Very comfortable environment, staff always ready to be voluntarily helpfu, go the extra mile. 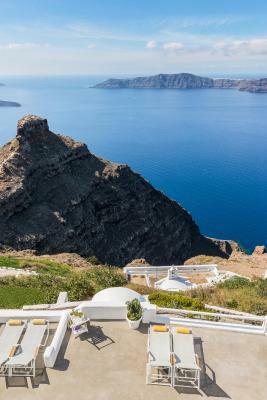 One of our top picks in Imerovigli.Featuring impressive views over the Caldera from guestrooms and public areas, Iliovasilema Hotel & Suites is on the top of the cliff, 1.2 mi from Fira. It offers a pool and snack bar. 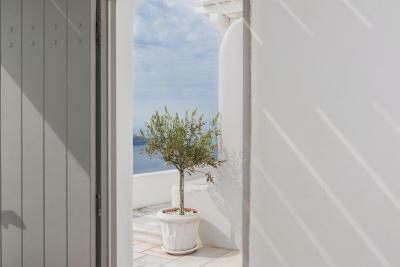 Offering elegant and minimalist décor in modern Cycladic style, all accommodations types at the Iliovasilema have flat-screen satellite TVs, well-stocked mini-bars and air conditioning. Free Wi-Fi is offered in all units. Iliovasilema Hotel & Suites’ bar area with views of the Aegean Sea is ideal for evening cocktails. Light dishes are served at the snack bar or through room service. Restaurants and bars are within a 3-minute walk. The hotel is 2,650 feet from Skaros. Thira Airport is 5 mi away. Staff at the 24-hour front desk can arrange car rental. When would you like to stay at Iliovasilema Hotel & Suites? 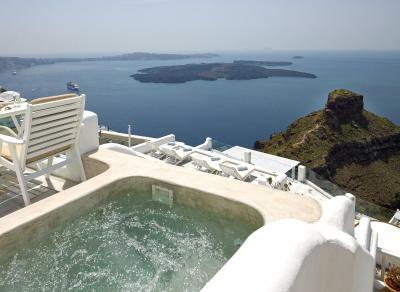 This suite has a private veranda with an outdoor hot tub and Caldera views. 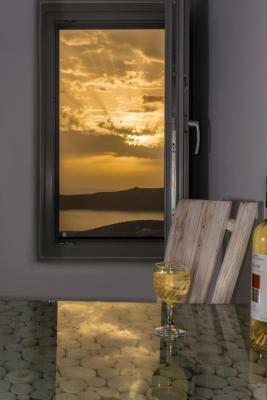 The generously appointed and luxurious suites consist of 1 bedroom and have a spacious living room with an outdoor private pool overlooking the Caldera. 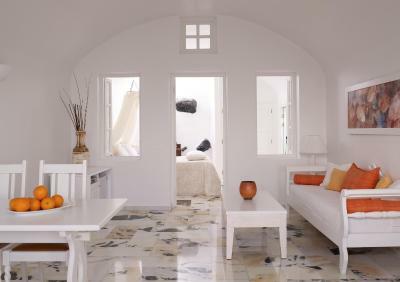 Bright, stylish and fitted with whitewashed walls, this room features a shower cabin in the bathroom. 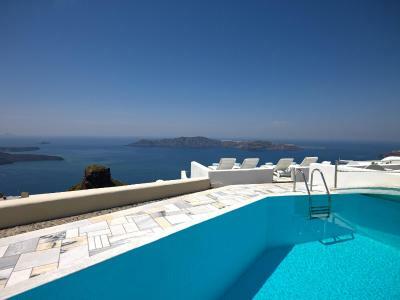 It comes with a semi-private or private balcony offering unlimited views of the Caldera. 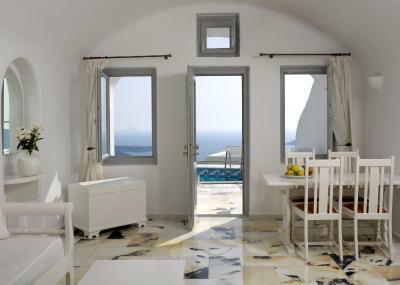 This junior suite offers Caldera Views and can accommodate up to 3 guests. These spacious suites offer a relaxing outdoor hot tub, Caldera views and a separate living room. 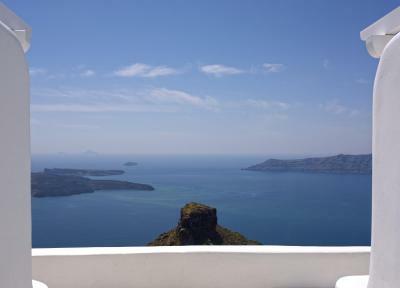 Offering unlimited views of the Caldera, this double room has a balcony, air conditioning and free WiFi. Offering unlimited views of the Caldera this suite features a balcony with a hot tub, a spacious living room and a dining area. 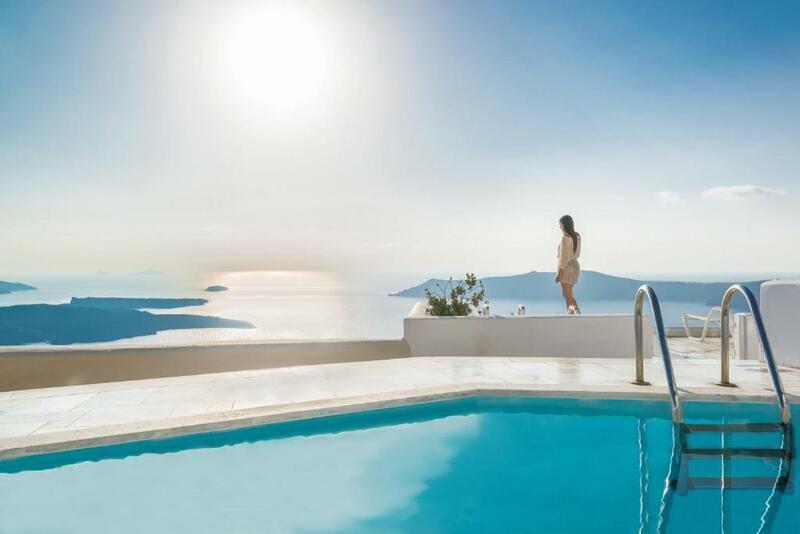 In Imerovigli, one of the most beautiful villages of Santorini Island, you will find the Iliovasilema Suites ("Iliovasilema" is the greek word for "sunset"). 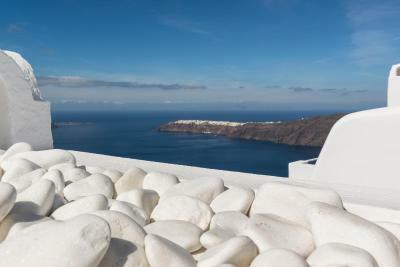 Iliovasilema is situated on the enchanting and world famous Caldera. 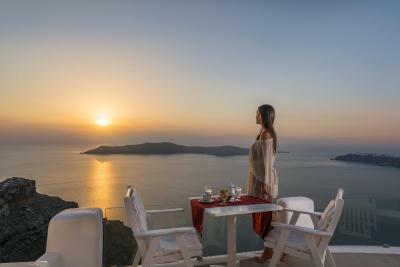 Built 350m above sea level, offers to its guests the most fascinating view of the volcano and the little islands of the Aegean Sea, as well as of the dazzling sunset. 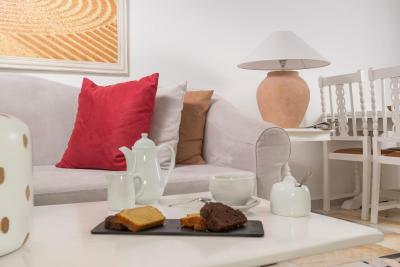 House Rules Iliovasilema Hotel & Suites takes special requests – add in the next step! 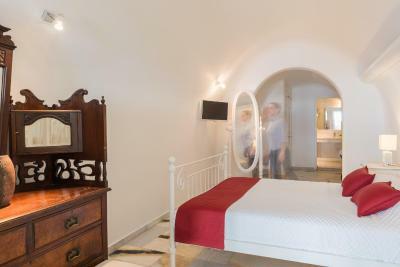 Any additional children or adults are charged EUR 85 per night for extra beds. Iliovasilema Hotel &amp; Suites accepts these cards and reserves the right to temporarily hold an amount prior to arrival. Iliovasilema Hotel & Suites accepts these cards and reserves the right to temporarily hold an amount prior to arrival. Please note that children up to the age of 12 cannot be accommodated in the suites for safety reasons. Kindly note that for group reservation of more than 3 rooms different policies may apply. 50% of the total amount may be pre-authorized at any time after the reservation has been made. Please inform Iliovasilema Hotel & Suites of your expected arrival time in advance. You can use the Special Requests box when booking, or contact the property directly using the contact details in your confirmation. Some rooms were nicer than others. The outdoor spaces far exceeded the indoor. Although all members of the staff were very friendly and welcoming, they did not always follow through. Also, many issues with drink orders/requests for ice etc, We were there early in the season so maybe all these types of kinks will get worked out. They should!! continental breakfast lacking choices considering standing of hotel. The view, location and staff! Everything was great. Staff were really helpful and friendly. View was amazing. Breakfast was great. 10/10. We would have preferred the room that was shown on our booking confirmation. Staff very attentive,anything you needed is only a phone call away, views from these rooms are amazing, not all the rooms look like the photos on the site, our confirmation showed a sitting area under cover, but on arrival we did not have this. Still was fantastic. No coffee or tea was provided in the room. Was very traditional, clean and cosy. Breakfast was delivered to our room and was very good. 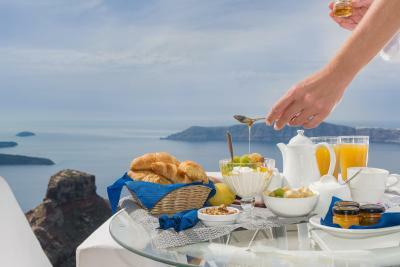 Breakfast on the terrace was amazing, staff could not have done more to make our stay incredible! The room furniture & fittings were really old & cheap looking. The room was large but very basic. The bathroom fittings were very old & cheap too - for the price I’d expect a rain shower and luxurious amenities but the shower was a basic hand held small head & amenities were quite basic as well. Breakfast was quite frugal as well - just a bread basket with a slice of spam-style ham & pre-sliced cheese, a bottled orange juice & instant coffee. The place is beautiful and well run I would recommend it to anyone. Staff are lovely and was a great way to end the holiday.